As we begin this series I am going to focus on the Core Values that permeate every aspect of the ministry of Redeemer Church. Our Core Values are: Gospel-Centered, Spirit-Empowered, and Mission-Minded. 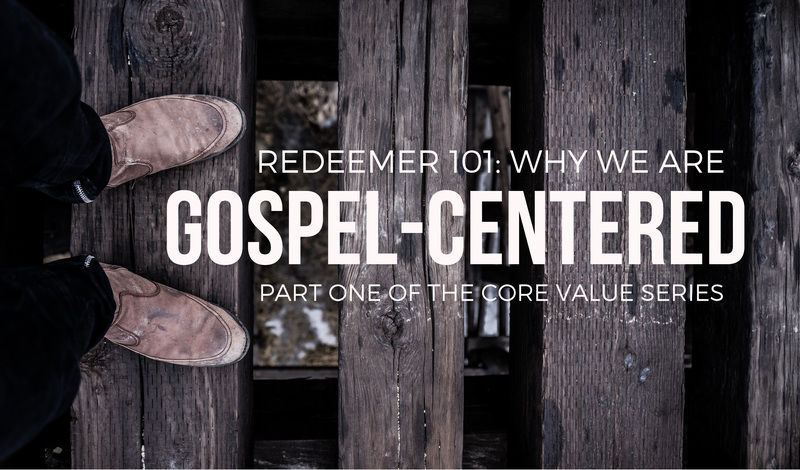 In this article I will briefly describe what we mean by being a “Gospel-Centered” church. First, we see that the Gospel is something to be proclaimed. Second, we see that the Gospel is good news announcing that we can be saved. Paul said that it’s “by this gospel you are saved”. You might be asking, “Saved from what?”, well, the short answer is God’s wrath. In 1 Thessalonians 1:10 we are told to “wait for his Son from heaven, whom he raised from the dead – Jesus, who rescues us from the coming wrath.” We also see in Romans 1:18-32 that the greatest problem of humanity is that due to our sinful rebellion against God we are separated from God and under his wrath. This separation began in Genesis 3 when our first parents, Adam and Eve, willfully chose to rebel against God and this rebellion severed humanity’s relationship with its Creator. Since then every human being has been born a “sinner” by nature and choice, and has turned away from God’s “good life” and chosen to define the “good life” for themselves, which is the ultimate rebellion against the Author of Life. The Gospel is the “good news” that God has done something to repair this relationship and remove God’s wrath from human beings. Third, we are told that the Gospel is the good news about what Jesus has done to restore our relationship with God. Now that we have discussed What The Gospel Is, we must now briefly discuss What The Gospel Does. This gets at the heart of why we believe that Gospel-Centered ministry is worth giving our lives to. The Gospel is not a static set of beliefs, but rather it is “the power of God” (Romans 1:16). Paul clearly states in Romans 1:16 that the Gospel is “the power of God that brings salvation”. Since I have already explained why we need to be saved I won’t restate that again. What does need to be said at this point is that salvation doesn’t come through our religion, good deeds, morality, or any other human effort. This belief is what separates the Christian faith from all of the world religions. These verses teach that salvation is by God’s grace through faith freely given as a gift from God. However, it is given to those who believe. Notice it says, “through faith.” This message must be believed and received in order to be applied to our spiritual account. The Gospel is not only the power to save it is also the power to sanctify. According to Wayne Grudem, sanctification is “A progressive work of God and man that makes us more and more free from sin and more like Christ in our actual lives.”3 The Gospel has the power to make us more like Jesus! One of the ways we express this truth around Redeemer is, “The Gospel is for Christians too.” I believe this needs to be said because often the Gospel is only thought of as the power to make people who are not Christians into Christians. This is a wonderful truth, but it is short sighted. The Gospel does more than make people Christians, it is also the power to make them act like Christians! Did you catch that? Paul said, “the gospel is bearing fruit…among you”. The Gospel had been “bearing fruit” within the life of the church, and the daily lives of the people were more and more reflecting the character and nature of Jesus. You might be wondering how that actually works. Let me illustrate it this way…with Sushi. There was a time in my life when I despised the thought of eating Sushi. The idea of putting raw fish into my mouth and chewing would create a gag reflex in me every time I would hear people talking about it. That was until….I actually ate some. Initially the texture felt a little strange in my mouth as I was chewing, but it didn’t take long for me to get the hang of it. A few days later I found myself actually craving it. What I discovered was…the more I ate Sushi…the more I grew to love it…to the point now that I actually crave it pretty consistently in my life. The Gospel is like that in the life of the believer. Initially it’s a bit foreign to our “work hard, nothing’s for free” world, but the longer you chew on the beauty of the “Good News” you soon come to realize there is nothing that satisfies more than Jesus. Then you find yourself loving Jesus more, and wanting to know him more. All of a sudden your life is changing…almost out of habit. Rather than our transformation coming from purely hard work and effort, transformation begins to take place in our life the deeper the Gospel goes into our heart. The more we grow to love Jesus and want to know him, the more we will see our lives line up with the kind of life he is calling us to live in the world. This is why we focus so much on the Person and Work of Jesus, which is The Gospel. It’s only through a deeper love for and understanding of Jesus and what He has done for us that we are transformed into his image. Why would we focus on anything else? D.A. Carson, “What is the Gospel? –Revisited,” in For the Fame of God’s Name: Essays in Honor of John Piper, ed. Sam Storms and Justin Taylor (Wheaton, Ill: Crosway, 2010), p.158. Timothy Keller, Center Church (Grand Rapids, MI: Zondervan, 2012), pg.29. Wayne Grudem, Systematic Theology (Grand Rapids, MI: Zondervan, 1994), p.746.